I am so thoroughly pleased with myself. I have finally managed to complete my Cake Boxes. I do have a you tube clip on how to make these here, but you will need a Petal Cone Die for my version. This was designed so I can use it in workshops for ‘Book to Look’. 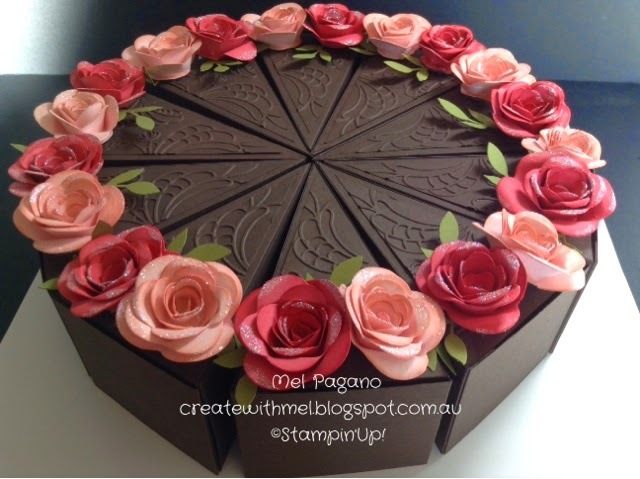 The idea being, I have a prize or reward inside and if you book a workshop or class, you can open a slice of cake and see what it is. It looks so good…I just wish I could eat it! Wow, two posts in two days! I’m doing well! And that’s because I have another gorgeous creation I wanted to share with you all. 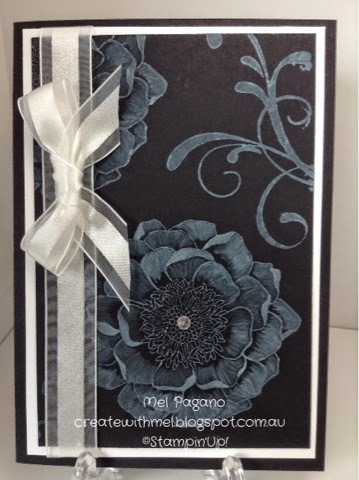 This is a special ‘card’, made for a special person, for her Big Birthday! This version is referred to as an ‘Exploding Card’. They are fantastic for that ‘extra’ special occasion, and I can’t wait to play a little more with different versions of these! All wrapped up in a gorgeous little present box. I added my writing to the underside of the lid. 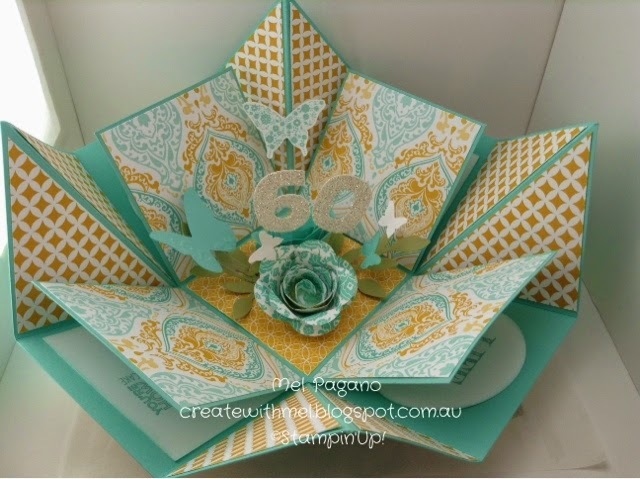 Made with Stampin’ Up!s beautiful eastern elegance DSP (which is retiring at the end of June), and using a few other goodies – spiral flower die and beautiful wings embosslits folder. 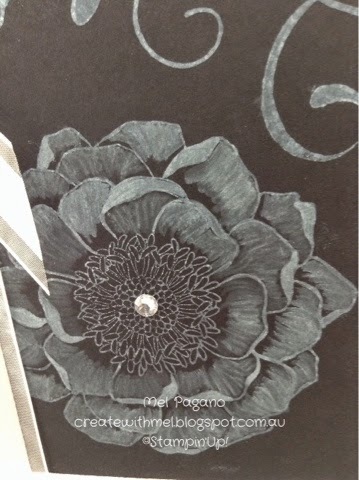 My scan n cut machine cut the 60 out of our glitter paper! All in all I think it’s pretty special! 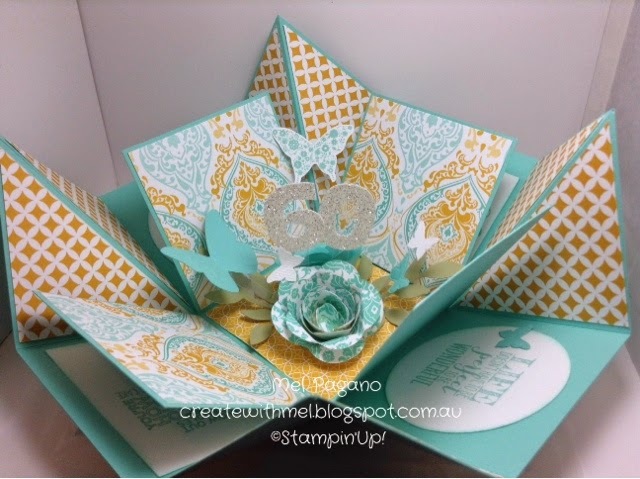 I wanted to share with you this card I created using the blended bloom stamp set. The technique was demonstrated at convention, and whilst I have used it with coloured inks, I must admit, I would never have thought of using white ink to achieve this effect – but I think it is stunning! 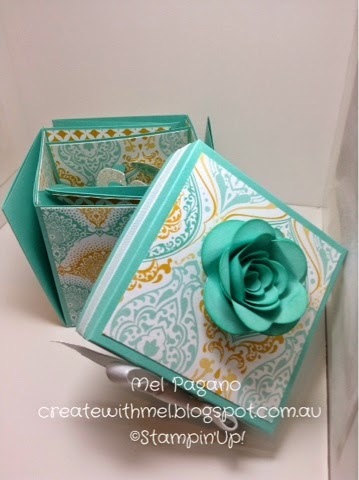 I adore this new stamp – Blended Bloom – which will be available with the new catalogue release on July 1st. It is so versatile and looks just as gorgeous when coloured with the new Blendabilities! 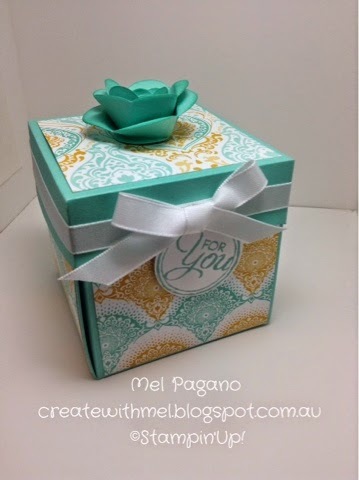 This simple technique involves stamping the image using the Whisper White Craft Stampin’ Ink. Then simply use your blender pens to pick up extra ink from lid of the ink pad, and use it to ‘colour and blend’ your image. Retiring Lists, New Catalogue, Sneak peaks! The Retiring Lists are out for stamps and accessories. Some of these items are already sold out. Contact me if you would like me to email you a copy of those lists! The best part about retiring products means a new catalogue is on it’s way! That means some gorgeous products will be gone forever, including products from the current Occasions Catalogue, at the end of June! But it also means that fabulous new products are on there way! Having had a sneaky peak at the catalogue – one of the benefits of attending convention – I can assure you, there are plenty of brilliant new products and stamps coming your way, and an extra 40 pages of catalogue! What’s not to LOVE! And that leads to an AWESOME Catalogue Launch Party! Happening on Monday 30th of June. Contact me for further information if you would like to come along. Cost is $10 to receive your new catalogue, do some make and takes, have a peek and play with new products, play a few fun games and of course have supper and enjoy some great company! With that, I leave you with a sneak peak of a card made with some new sets and coloured with our amazing Blendabilities!